This is the third in a series about how my local libraries (Baillieston and Shettleston) afforded me a wonderful musical adventure and the huge impact they made on me. I joined them as a 16 year old because I couldn’t afford albums and borrowing from them appeared to me to be the perfect solution…which it most certainly was. 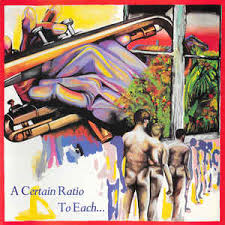 To Each… is the second album and debut LP by English band A Certain Ratio, released in 1981 by record label Factory. It followed on some eighteen months after the release of the band’s first album, The Graveyard and the Ballroom, available in cassette only in a variety of coloured plastic sleeves. The sleeve is apt as it alludes to the broad palette of sound employed by ACR throughout this record. At the time of it’s release the band were continually and lazily branded as Joy Division copyists. They weren’t. The bass and drum work of Jeremy Kerr and Donald Johnson locks in the way that Holger Czukay and Jaki Liebezeit did with Can, especially on the album Tago Mago. It remains an intense listen, an artistic statement full of weird electronic sounds, dub, funk and jazz elements mining yet another individualistic sonic path which to my ears is still futuristic.